When you think of Mexico you instantly think of the gorgeous white sandy beaches and turquoise waters. But what if we told you there is even some cooler to swim and snorkel in Mexico? Put visiting a few of the best cenotes in Mexico on your bucket list. After laying on the beach in Playa del Carmen or Xpu Ha beach for a few days you’ll be ready for an adventure. There are over 6,000 cenotes in Mexico in which most cenotes are located in the Yucatan. In this cenote guide, we’re going to go through some of the best cenotes in Tulum, Playa del Carmen, Merida, etc. We’ve included the entrance fees and address with linked maps to help you find all of these amazing cenotes. Q: What is a Cenote? A: The Yucatan Peninsula is home to more than 6,000 cenotes or sinkholes, thought to be formed by the meteor that killed the dinosaurs. These ancient cenotes have been a special place for many millennia, they were a source of fresh water and thought to be a sacred place for the Mayan People. The Mayans thought these cenotes were the doors to the underworld and would often make animal and even human sacrifices here. Today, thankfully the sacrifices have stopped but now the cenotes are a super unique geological and historical place to explore. A cenote is an underwater sinkhole that is revealed after the cave roof of limestone bedrock collapses. Some cenotes are completely open while others are partially collapsed leaving some of the cenotes underground like Calvera Cenote and some even require several steps walking underground to access. These sinkholes are very similar to small ponds. The water in cenotes is super clear and clean, it comes from rainwater that is filtered in through the ground. Each cenote is different so we suggest visiting more than one. Q: How Many Cenotes Are there in Mexico? A: There are over 6,000 cenotes in Mexico. The best cenotes in Mexico are located in the Yucatan. Q: What caused the Cenotes in Mexico to form? A: Cenotes are formed by underground rivers carving out the limestone caves. The open-topped cenotes are generally caused by trees breaking the thinned out layer of stone with their roots. While cenotes exist in other parts of the world, scientists believe the same asteroid that killed the dinosaurs created the extensive system of cenotes in Mexico. There is a visible ring of cenotes that corresponds with the impact of the Chicxulub Crater impact that started the mass extinction event that wiped out the dinosaurs. **Please make note that only biodegradable sunscreen should be worn in sunscreens. Do not apply any lotions or regular sunscreen if you’re going to visit a cenote. These lotions can poisonous to the fish and plant life. Many of the cenotes in Mexico will have signs reminding you. It’s best to bring biodegradable sunscreen with you, you can get it here on Amazon. The best way to visit the cenotes in Mexico is by rental car. These aren’t really places you want to visit with a large group, they are best explored independently. Renting a car in Mexico can sound intimidating but in the Riviera Maya, it is easy. There are also a number of cenotes right off the highway near Tulum and Playa del Carmen which you can easily take a shared taxi to. If driving in Mexico isn’t your thing you can hire a private driver for the day for reasonable prices, it’s best to negotiate in person for the best prices. Another option is to join a group tour that is visiting cenotes, many of the organized tours visit a cenote or two with a famous Mayan ruin like this $79 Chichen Itza, Il Kil cenote, and Vallodid lunch tour. The town of Tulum along HWY 307 in the Yucatan has some of the highest concentration of Cenotes in Mexico. The popularity of both Tulum and the cenotes has lead to many of the cenotes being opened for visitors. We’ve been to just about all of the best cenotes near Tulum and here is our mini guide to our favorites and all of the details. Dos Ojos is a must visit cenote in Tulum. The entrance fee is rather steep but there are actually several cenotes in the Dos Ojos complex, some require an additional payment. If you’re a diver this is a must dive cenote. If you are diver you need to get to El Pit. Frequently rated as the dive master’s favorite in Tulum and the Riviera Maya. This is one of the deepest known cenotes in Mexico and the deepest in the area. What makes this cenote such a treat to dive are the stunning beams of light that come into the narrow cave opening and penetrate deep into the cenote. Every time I visit Tulum I am torn between diving new cenotes or jumping back into Cenote El Pit. If you love underwater photography you have to dive this cenote. El Pit is part of the Dos Ojos complex. and you enter via the same road as that cenote. There is no snorkeling in El Pit, this one is for divers only. The reason for this is that there is no shallow area of this cenote and there wouldn’t be much to see for snorkelers in El Pit. If you ask us this is the best cenote in Tulum. After many trips to the Yucatan and visiting tons of other cenotes in Mexico we love Calavera. This cenote is located just outside of Tulum, you could easily ride a bike there from Tulum Town. It’s not on most tourists radar YET, none of the cenote tours stop here so you are likely to have it to yourself if you come early or in the late afternoon. We love the two hole you can jump in to access the cenote! Snorkeling in cenote Calavera is good but there is also some amazing diving. Calavera Cenote is also known as the “Temple of Doom” as there several animal skeletons down there that can be seen if you are diving. In addition to the historical artifacts, this cenote also has an amazingly defined layer that separates the fresh and saltwater levels. Behind El Pit cenote this was my favorite cenote I have dove. Read more on Cenote Calavera. Located halfway between Cancun and Tulum Playa del Carmen is a popular tourist beach town with close proximity to many of the top cenotes in Mexico. The best way to reach these cenotes from Playa del Carmen is to self-drive. Renting a car in Playa del Carmen is easy and the best way to explore the cenotes. Many of the same cenotes near Tulum can easily be visited from Playa del Carmen as well. Here is the list of Cenotes that are close to Playa del Carmen, Mexico. A favorite of many locals and expats, Cenote Jardin del Eden is a large, very clear water cenote. It’s the perfect place to cool off during a warm day in Playa del Carmen with lots of shady trees surrounding the cenote. Here you’ll also find a large deck and even a platform to jump in from. However, we prefer the opposite side of the cenote because there are generally fewer people over here and it’s very peaceful. In the middle, there are large rocks sitting only a few feet from the surface of the water which is fun to play around on. Once you arrive here you’ll see why it is called the Jardin del Eden or Garden of Eden in English. This idyllic setting with lush jungle surrounding this crystal clear turquoise colored water is surely reminiscent of the biblical version of Eden. Be sure to bring your snorkel, mask, and fins to explore this beautiful cenote. Also, do your part to keep this cenote clear and the nature healthy by using biodegradable sunscreen, or avoiding using sunscreen while in the water. You can even eat dinner in a cenote in Mexico in the popular tourist town of Playa del Carmen. This is a dry cave that has been converted into a restaurant. There are several tour companies that sell a combined tour of Chichen Itza and visit Il Kil cenote at the end of the day. Similar to Suytun in style and a cracked top portion. However, as of now, there is no platform or pier to walk out on and it remains more natural looking. Cenote Zaci is located right in Valladolid. We always suggest having lunch in Vallodid after visiting Chichen Itza and you could easily walk over and check out Zaci while in town. This isn’t the most impressive cenote but super easy to get to. Los 7 Cenotes isn’t just one cenote, this is a whole day adventure and experience located 80 minutes outside of Merida. 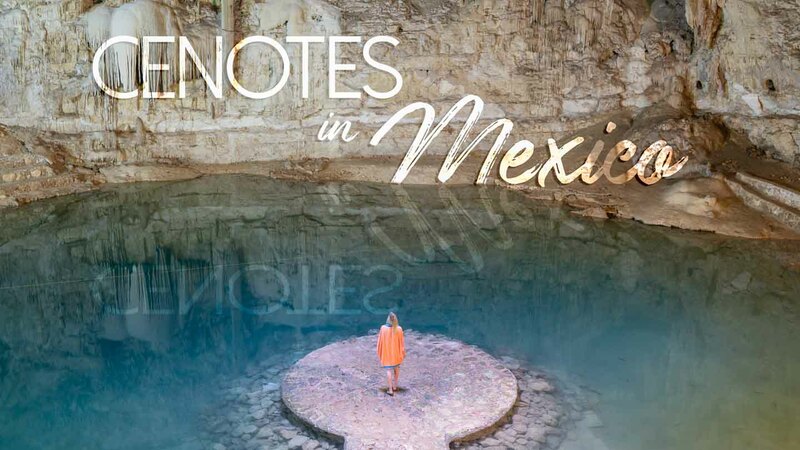 Click here for more about Los 7 Cenotes and reviews. If you’re vacationing in Cozumel or on a cruise that stops in Cozumel for the day you’ll have to take the ferry from Cozumel to Playa del Carmen. Once in Playa del Carmen you book a cenote tour or rent a car in Cozumel, they are super cheaper if booked in advance here we use to live in Playa del Carmen and never paid more than $5 a day. There are several cenotes near Playa del Carmen and ever more cenotes in Tulum only 45 minutes away. You could make a whole day trip from Playa del Carmen visiting some of the best cenotes in Mexico. Most of the cenotes in the Yucatan are between Playa del Carmen and Tulum. There aren’t any cenotes in Cancun that we would recommend. The best thing to do is rent a car in Cancun for the day or your entire trip and spend a day visiting the best cenotes in Mexico. Depending on the cenote you don’t want to bring too much stuff as you’ll want to spend most of the time in the water. The most famous cenotes in Mexico like Il Kil will have lockers you can rent to store your belonging. If you come on a cenote tour or you rented a car in the Yucatan leave unnecessary items in the car. The number one thing to bring to a cenote is biodegradable sunscreen. Regular sunscreen is not allowed in cenotes, you’ll see signs posted all over the cenotes. Regular lotions are not healthy for the plants and fish in the cenotes or in the ocean. For sure wear biodegradable sunscreen in the cenotes (since it’s a small space) and if you can afford it also the ocean. A waterproof dry bag is great to have in general for any trip whether it be the beach, cenote, hike in the mountains, etc. You never know when you’re going to get caught in a rainstorm and need a place for your expensive camera, wallet, phone, etc. A dry bag is great to just throw all that stuff in and then jump in the cenote. Buy on Amazon now for as cheap as $9. We have a backpack dry bag so it’s easy to hike with and it holds a lot of stuff. The best camera waterproof camera is a GoPro and it should definitely be in your bag for visiting cenotes. We also suggest a GoPro dome for fun over-under shots, make sure to read our article on GoPro dome tips to getting those epic shots. Bring a quick dry towel so that by the time you get to the next cenote stop of the day it’ll be dry. If you’re like us you’ll want to see several of the best cenotes in Mexico. This cheap quick dry towel is also a sand-free towel! If you aren’t renting a car in Mexico and able to drive yourself to several of the best cenotes in the Yucatan the next best thing is a cenote tour. There are several cenote tours in the Yucatan that visit a handful of cenotes in one day. If you’ve never been to some of the famous ruins you should consider a cenote tour that combines Coba Ruins, Tulum Ruis, or Chichen Itza. This is a great price to visit one of the most Mayan ruins in Mexico and one of the coolest cenotes in the Yucatan and topped off lunch in a quintessential Mexican town. We always stop for lunch in Vallodid and walk around the central park. If you’ve been to Chichen Itza before or are looking for a less visited Mayan ruin head to Coba. You can actually still climb this ruin which makes it unique. The best way to experience the cenotes is to dive in. Each cenote is very different and most aren’t just a single sinkhole, but connect to a vast underwater cave system full of chambers and swim-throughs. If you go with a licensed instructor you only need basic a diving certification to dive in the cenotes. My husband and I will be going to Tulum in May. These is our first time visiting Mexico. My question is, what travel place would recommend for excursion…for seeing the ruins of Chichen Itza? If you aren’t up for that I would visit a few tour offices in whatever town you are staying in a try to get the best feel for how the tour will be run and if it fits what you are looking for.